My most recent return to the US had a cinematic twinge to it. For example, I got to have a huge fanboy moment by visiting the Paramount Ranch in Malibu and seeing some of the sets used in the mesmerizing HBO drama Westworld (among other shows, including Dr. Quinn, Medicine Woman). 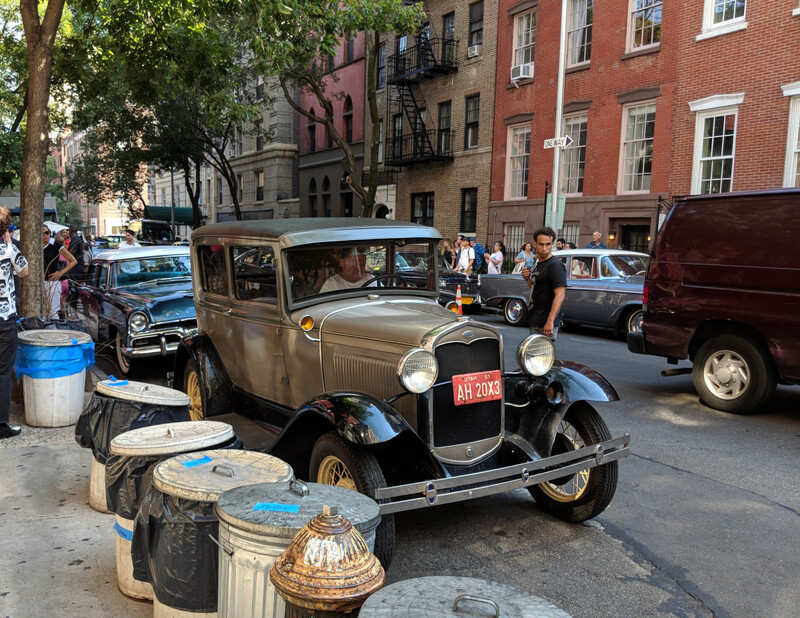 And, on the other side of the country, my friend TJ and I stumbled upon a collection of period vehicles in a film shoot in Greenwich Village. Having lived in New York City, I’m no stranger to film shoots. You generally don’t stop to look unless you’re a fan of the show being filmed (and most New Yorkers probably wouldn’t stop at all). Or, as Curbivores may appreciate, you stop if you see some vintage cars. 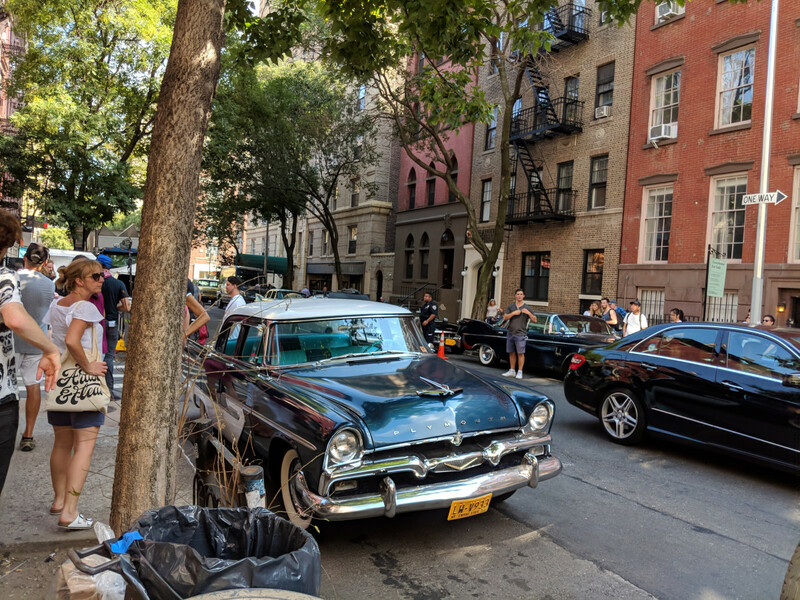 My friend Jason took some photos of a film shoot in the Lower East Side a few years ago which I shared here. Many of the comments you left highlighted how the selection of cars seemed incongruous. I’m very easily distracted when a period-incorrect car appears in a TV show or movie but many of you argued that, while the featured cars were of the correct time period, many of them were a little too clean for 1970s New York City. I was thinking about your comments when I walked past this film shoot. I have no idea what was being filmed and I’m perplexed why some of the cars were much older than the others and why some of them wore Utah plates. The earliest this production must be set would be 1960 based on the dashing Imperial in the background. Would any Model A Ford be looking as good in 1960 as the one in the lead photo? Then there’s the usual issue: the cars look just too damned clean. I wonder what some productions do – if they do anything – to make vehicles look older. 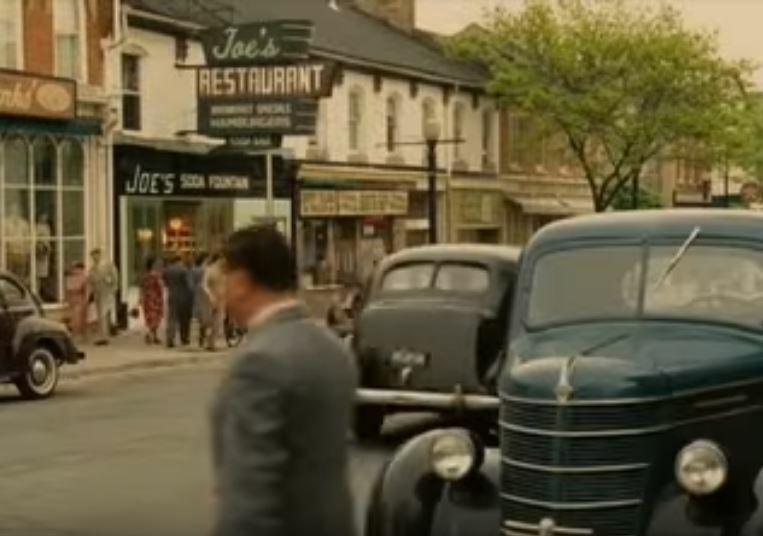 Do you just throw some dirt on or do you tinker with some CGI as is often done to remove anachronistic shopfronts and signage? Tell me: does this street scene look right for New York City, circa 1960? Excellent point George. The skinny whitewalls on that 57 Stude were not even offered until about 1962. I owned a 1962 Lincoln a few years back and so this is an area of my expertise! 1961’s all had wide white walls. 1962’s could have either narrow or wide. The narrow versions were fairly wide though. So the Studebaker would not have narrows unless it was 1962 or later and they were replacements, and those are a little narrow for 1962. But these sorts of things are missed in even big budget movies all the time. I used to do props and sets in theater. A big aspect is budget. Given budget, I often made decisions on fooling most of the people most of the time. You don’t want to take people out of the experience of suspension of disbelief by some anachronism. More budget, fewer compromises. In this case hardly anyone would know when narrow whitewalls were available, or even notice whitewalls or not. But then even big budget films can get cars very wrong. For example, remember “Carol’ a few years ago? The main character’s car (big blob of a postwar Packard convertible) was a find. The background cars were terrible for many reasons. 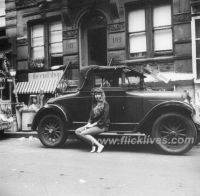 Miss Beatnik of 1959, with 1931 Chevrolet Independence owned by Jean Shepherd, Greenwich Village, New York City. Photo by Fred McDarrah. I agree that it is an odd assemblage. One, the ages are odd. A Model A would really have stood out in 1960, and it certainly would not have looked that nice. Two, I don’t ever remember any period scene in NYC where everything parked is within 3 or 4 years old. Maybe in a suburban shopping center parking lot, but not along a NYC sidewalk. Also, I see nothing built by GM in these shots – in real life something like 60% of parked cars were usually GM stuff. Three, that 57 Studebaker would stand out anywhere. And you are right – NYC cars always seemed to have big dents in them and a deep coating of city grime. The Stude would probably have been noticeably rusting by 1960. But all in all, it would be a great group of cars just to ogle at (as I am doing now). I’m glad that I can remember NYC when the streets were filled and lined with American cars. A different era, a different ethos. There is a 1983 Oldsmobile Custom Cruiser station wagon for sale on CL in my area that claims to be off Fear the Walking Dead. I’m not sure how true that claim is, but in the ad there is a picture of the hood and it looks very dirty. He says it’s just a spray on coating that can be peeled off. 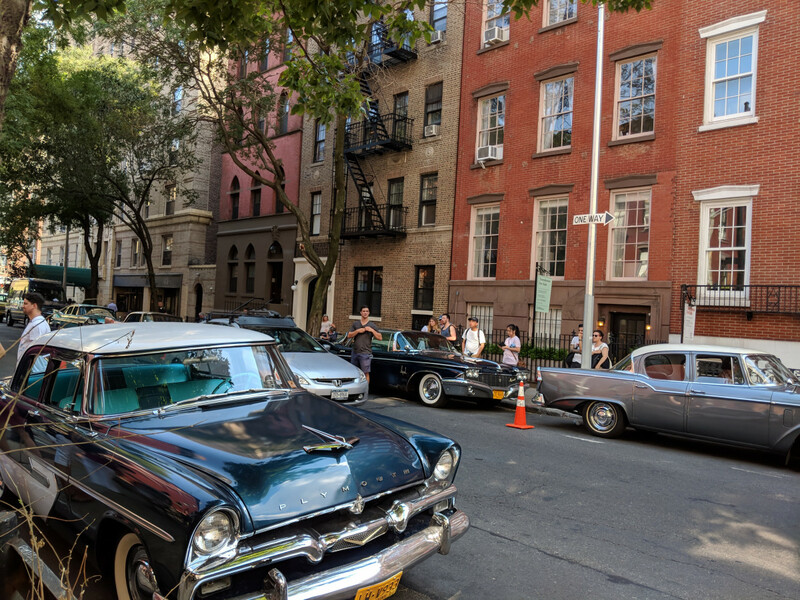 Agreed, those cars are too nice looking for 1960 NYC. Anyway, I’ve seen a company bringing movie cars in to line the streets, they are not really restored and in some cases do not have engines. They looked quite period correct. I’ve often wondered about that — if a production company needs period correct cars that are just going to be parked in the background and don’t need to actually be driven, if they’ll just find some that are ready for the junkyard but are otherwise intact and give them a cheap paint job to make them look presentable on camera. From what you say it sounds like they do do something along those lines. I’ll venture a guess and say your town looks more like an idealized version of what people would like to think ‘small town America’ really is. Even if it really isn’t . . . it’s the illusion that counts! For movie fans reading there’s a 1976 film called NEXT STOP, GREENWICH VILLAGE directed by Paul Mazursky. It takes place in 1953 and is a semi-autobiographical movie of director Mazursky’s life at the time. Stars Lenny Baker, Ellen Greene, Shelley Winters, Christopher Walken, Jeff Goldblum. I never could find it for rent on tape so I ended up buying it new on VHS at least 21 years ago just so I could watch it; it’s probably on DVD by now. Maybe it depends on what part of New York you’re talking about. 1960 New York means one film to me, Breakfast At Tiffany’s. Paul and Holly’s block certainly had some really nice cars on it, filmed in the present day. The only way this would work is if the owner of the Model A was portrayed as a car nut who had meticulously restored the car himself and it was his pride and joy – only if his character was written this way would it make sense to have such a pristine 1930s car in a somewhat gritty 1960 New York City. I doubt that any 3-4 yr old Studebaker or Imperial would have looked that clean in this time period as cars tended to rust/deteriorate pretty quickly, esp. in salty areas. As restored period pieces they look really nice, however! 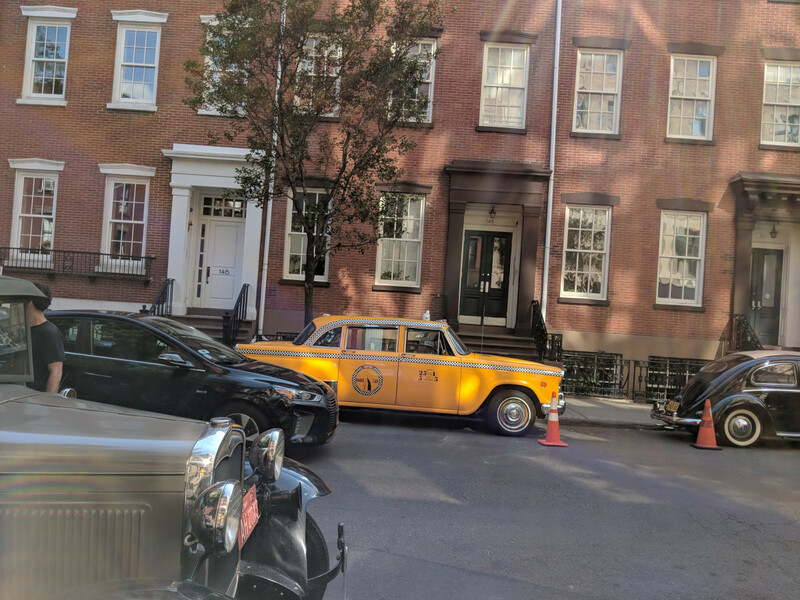 I’m going to say this setup was for the fantastic, multiple Emmy-winning Amazon series “The Marvelous Mrs. Maisel.” The first season was 1958. Season 2 will start in 1959 and later in the season might be 1960. They often do location shoots in the Village, which is the location of the “Gaslight” club where she performs standup. That was my thinking as well. I can’t think of any other show out right now that is set during that time period. It could be be a new one, of course, but the odds are actually kind of low, I think. It takes a lot of money to shoot on location, especially in NYC. And I’ll second your opinion about the show. It’s great and I’m really happy it got so many awards. They absolutely deserved them. Fantastic show! 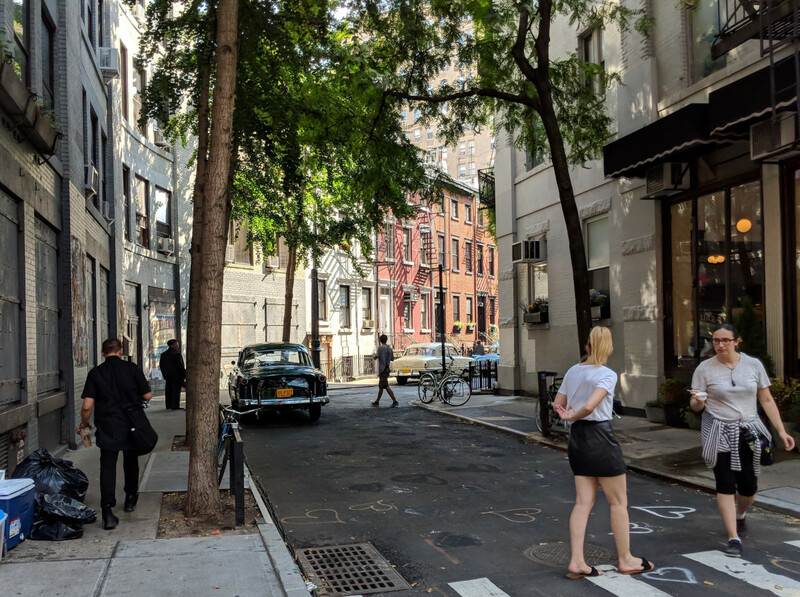 But the background car choices do stand out, like the pristine red early 1940s sedan the Masels walk past a few times heading into the gaslight. They get a slight pass because the whole aesthetic of the show is idealized anyway. Nobody’s Pyrex ever came out of the oven looking that perfect either. Walked past a shoot in London a couple weeks back and did find interesting that they seemed to have commissioned current police and fire vehicles. The plastic liners in the garbage cans jumped out at me. They were definitely not used in the 1960s. I don’t think the garbage cans are part of the shoot. I think they’re the actual garbage cans that belong to residents of those apartment buildings. You do not see garbage cans, galvanized steel or plastic, on the streets in Manhattan ever. In a lower density Brooklyn area where I live plastic cans are put out, but are galvanized steel ones even a thing any more? So these are definitely props. But one wonders if the plastic liner thing was well researched by the props department. That’s what I noticed . The blue bags are for recycling . On the Model A, what are the small orange lights sticking out from the sides where the hood meets the cowl? Some sort of aftermarket add-on turn signals or something? The lights on the Model A are cowl lights, original equipment, but the yellow lenses are modern. The ’50s cars are not only too clean; the paint itself is too good on most of them. Plymouths and Studies never had that deep luster even when new. Caddies and Imperials, yes. I suppose the owners or rental services won’t allow the cars to be convincingly dulled down or roughened. Well that just leads to another question — what were cowl lights for? Paramount Ranch, eh? Practically in my back yard. Pretty dry this year, isn’t it? –A great reminder of why our old cars don’t rust here…but the paint and rubber pieces get ruined in 10 years. I hope you enjoyed your journey. I sure did. And it did seem rather dry but then I’m used to dry, often fire-ravaged landscape living in Queensland. This article raises some good and factual points, but it’s really no different than any Western movies that you ever saw where the stage coach pulls out of the stop at a full gallop and 20 miles later pulls into the next stop still at a full gallop. Horses cannot take that kind of abuse. It’s just someone’s (who doesn’t know better) image of what life was probably like back then. Paramount Ranch was used as a sports car road-racing course in the Fifties. Another CC connection! My favorite recent “period car” show has been “The Russians”, set (in DC) in the Seventies and Eighties. After several seasons, once does notice the same background cars (hey, didn’t that Accord just drive by in the previous scene? ), but the progression has been good as Honda’s take over from Volares in the background, and the main male character develops from a Camaro driver, to a Lincoln MkVII driver. The use of cars, though not the specific makes and models, plays a major role in the story. You meant “The Americans”. Who are actually Russians. I notice the same thing about so many of the shows from Britain and lately, Australia, that that are shown on PBS. All the towns look so clean and charming. The windows of all the houses and shops are clean and shiny, although some of the old stone and brick houses do look a bit depressing. And all of the charming little English cars are clean and shiny. And the weather is always nice and sunny. I would imagine that England and Australia probably aren’t really like that, but it is nice to be able to escape into a fantasy like that. An old time “One Way” sign added too. In the last 2 pics. Seems only in TV & the movies you can still ride in a Checker Cab. I’ve actually looked into it, as I would love to ride in a Checker cab one day. There is in fact a tour company in New York that gives private tours in restored Checkers. It’s kind of pricey, and probably a really touristy thing to do, but I’d do it just for the experience of riding in *the* iconic New York taxi. But I don’t have to go all the way to New York to ride in a Checker. Right here in Northern California there’s Marin Checker Taxi: https://archives.sfweekly.com/thesnitch/2011/12/15/checker-cab-a-hollywood-refugee-spotted-in-san-francisco That’s an old article, but he still appears to be in business based on his Yelp reviews (for some reason he official web site is blocked at my office), although from the looks of it the cab seems to spend about half its time rented out for weddings.